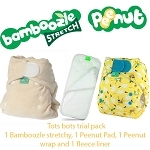 They are a all in two nappy system consisting of a one size shell also known as a cover or wrap and inserts in size small or large, the inserts popper in so they stay in place. Microfibre Our nighttime doublers have 6 wonderful layers of micro fiber, for extra absorbency, and work as a doubler with Buttons daytime inserts snapped on top. Buttons cloth inserts snap right into our one-size diapers covers. Plus, they come in 2 sizes for your growing baby (small fits babies 9-20 lbs., large fits babies 20-35 lbs. )Note: the nighttime doubler is made to be used with our daytime insert snapped on top. Only the daytime insert has a top layer of soft moisture-wicking fleece to keep baby's skin dry.